At long last, the Round House has truly become our new HOME and heart of the community. The kitchen is fully functional. The sweet round dining table has been moved over from the Log House and already we’ve had several delightful dinners around it with many ‘beloveds,’ family and friends of Sacred Groves. The Great Room feels wonderfully cozy despite its ‘Great-ness.’ The grounds are sprouting green all over as the seeds we’ve been planting over the past couple of months begin to sprout (despite our cold spring). We purchased several ‘edible plants’ from permaculture specialist (and dear friend) Chuck Estin and they are slowly getting settled into the dirt. The place is beginning to feel lived in and loved. We are thoroughly delighted! The most recent thing to be completed was the ‘finishing’ of the floor of the Great Room. It looks unexpectedly BEAUTIFUL! 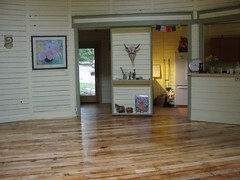 This floor is amazing in that it is GREEN to the max, salvaged and thrice-used. We bought it recycled from a demolished warehouse in downtown Seattle, used it to build the forms for the foundation, de-constructed it after the concrete dried, and then used it for flooring in the Great Room. The use of the product “Osmo” bought from EcoHaus (thank you Van Calvez) was a good choice, bringing out an unexpected amount of color and texture in the wood. Tere has also been busy finishing the laundry room and second bathroom, and one of the yurtlettes. Of course there are still dozens of other little things to finish up, but we’re gettin’ there–one task at a time. This week Tere has flown to California to visit her folks and build them some steps and hand-rails on their back porch–such a devoted daughter she is! The next really important task at hand is calling-in the PERFECT people to share this beautiful land with us. The log house is nearly empty now after weeks of slow sorting-out, moving and cleaning. We’ve been getting it ready for a couple or small family who will fall in love with its charming sweetness, fall in love with the land here, and all of us currently living here– and want to move in and make it their new home. We’re eagerly awaiting their arrival, whoever they are! And we plan to get one of the yurtlettes ‘tricked out’ in such a way that it attracts a new resident too–also someone who falls in love with our scene here, the round house and cabins, the land and those of us living here. We’ve created such a special community on this sweet little dead-end lane, deep in the forest, surrounded by birds, deer and other wild creatures. We just KNOW there are people out there who will find this place ‘heaven on earth’ just as we do. We look forward to meeting them! This entry was posted in News on May 12, 2008 by theresecharvet.